The semi finals stage in both Junior and Cadet girls’ singles will be contested against players representing the same country. Thus one Indian girl each in Junior and Cadet categories will have the chance to play the finals and contest for the gold at Indore. But with the girls from Chinese Taipei on a winning streak, the challenge will be fierce. For the athletes, playing against their own teammate at the semi finals of an ITTF World Junior Circuit Premium event can be a challenge in itself. The entire responsibility relies on self, there would be no coach to discuss strategies and no supporters from home country in the gallery cheering exclusively for that athlete. This is the exact scenario that will be witnessed on the final day of the Indian Junior and Cadet Open in the girls’ singles events. Wu Yi-Hua and Su Pei-Ling, both representing Chinese Taipei will be competing in the first semi finals of the Junior girls’ event scheduled to start at 11am IST. The second semi finals will be played against host nation’s Sreeja Akula and Varuni Jaiswal also at 11am IST. Thus one Junior each from Chinese Taipei and India will be playing against each other in the finals of the Junior girls singles. With Chinese Taipei making a clean sweep of gold medals in the team event, the Indian girls have a wonderful opportunity and a responsibility to prevent Chinese Taipei from repeating the same feat in the singles. 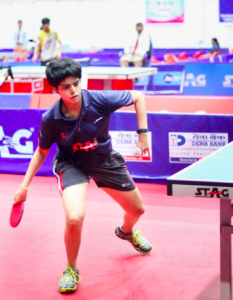 Ranked no 47 in the Under-18 junior girls’ world ranking, Archana Kamath, lost narrowly to Wu Yi-Hua in the quarter finals in a full seven games duel. Archana, the highest ranked player at Indore in the junior girls’ section, fought hard with her attacking game but bowed down to Wu with a score line of 11-9, 4-11, 6-11, 11-7, 13-11, 7-11, 7-11. Archana is currently ranked 11 in the world junior circuit standings and had won the title at Morocco Junior and Cadet Open. This heartbreaking loss only suggest that she must be able to maintain consistency at the international arena to steadily climb up the ladder. Just like the Junior girls singles line up, the Cadet girls singles will assure both India and Chinese Taipei an entry into the finals. Ishita Gupta will contest the first semi finals against teammate Manushree Patil. At Indore, both girls made their debut at the international circuit and thus will give their hearts out to play the finals of an ITTF World Junior Circuit for the first time. The second semi finals will be played between Chang Ju-Chia and Huang Yu-Jie, both representing Chinese Taipei. Chang is currently unranked and Huang is at number 32 of the Under-15 girls world ranking. Both have never contested against each other at an international event and thus the quest to the finals will be thrilling. Semi finals commence at 10.30am IST. Watch the event LIVE on ITTF’s Youtube Channel.